The world’s premiere destination for bonefishing are the islands of the Bahamas. The Bahamas are made up of over hundred islands, islets, and cays, conveniently located in the southern part of the western Atlantic Ocean, close to the Caribbean Sea to the south and the Florida peninsula to the west. This positioning of the Bahamas gives the islands some of the best conditions for fishing. With warm waters that are teeming with life, fishing in the Bahamas allows visitors to experience a wide variety of fishing as you go after all kinds of top game species. Bonefishing, however, is renowned in the Bahamas. The bonefish here are plentiful year round and bonefishing has become almost synonymous with Bahamas fishing. If you are heading to Grand Bahama Island in Freeport and you want to experience bonefishing, have we got the perfect trip for you! The team behind Folley & Sons is a legend in these parts. The original Folley, Captain Carl Folley, hails back to the time of Prohibition in the Bahamas. Today, his adopted son Tom runs his historic operation, offering the hands-down best bonefishing experience in Freeport. Captain Folley and his hand-selected team of Freeport bonefishing guides run trips every day out to the flats on the West End of Grand Bahama Island. Everything you need for a successful Freeport bonefishing trip is provided to you, including the expertise and knowledge of these highly experienced bonefishing captains. Bonefishing is one the most exciting types of fishing available in the Bahamas. 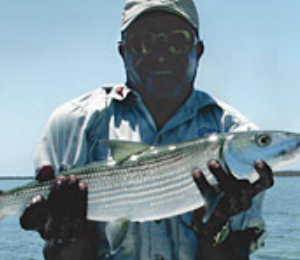 The skill required for catching bonefish is unique and specific to this elusive, silver-tinted fish. If you love fishing, or if you are curious about more unique styles of fishing, then bonefishing is the excursion for you! We are eager to share our love and our knowledge of bonefishing with guests who come to Freeport, and we are happy to accommodate both cruise ship guests and vacationers staying at one of the many amazing resorts on the island. What type of boat is used for these trips? Our Freeport bonefishing trips head out on Maverick flats skiffs with poling platforms. We can only take a maximum of two guests on each charter. What if we have more than 2 people who want to go bonefishing? We have a fleet of 3 Maverick flats skiffs for bonefishing. If you have a group of more than 2 passengers who wnat to bonefish, you will have to rent out a second boat. We will make sure the boats go to the same destinations so you can fish together as a group. I have been to the Bahamas many times, but Folley & Sons Freeport Bonefishing is one of my favorite trips! It includes everything that everyone should do here. As a Bahamas veteran, I can say only the best about this experience!